By Moses Walubiri Legislators on a select committee instituted to carry out an onspot check on areas affected by nodding disease have ordered ministry of health (MoH) to account for sh400 earmarked for research into the causes of the debilitating syndrome. This comes on the heels of a field visit by MPs to the districts of Gulu, Kitgum, Lamwo and Pader, which showed that the said research has not been carried out. “We have just completed an onspot visit to all the affected districts, but no research has been carried out, yet money was earmarked for this activity. We have summoned MoH to account for this money,” Bitekyerezo said. The sh400m research fund was part of a holistic government response to stem increasing cases of nodding disease in the Acholi sub-region, tabled before parliament in May by Dr. Richard Nduhura, state Minister of Health (General Duties). Other interventions include establishment of treatment centers and provision of fortified food supplements to children afflicted by the disease. Meanwhile, MPs Tuesday clashed over the causes of nodding disease as they demanded for expeditious research into the causes of the disease. The MPs, especially from Acholi said uncertainty over the true cause of the disease has spawned anxiety and conjecture, thus giving way to superstitions. This, they noted, has seen witch doctors take advantage of desperate parents to fleece them. “The witch doctors are making a kill over the disease because little is known about its cause. In Amuru, a witch doctor was arrested after 15 children afflicted with nodding disease were found at his shrine,” Gilbert Olanya (Kilak County) said. Some parents, MPs said, have abandoned nodding children thinking that the disease is either contagious or caused by spirits. 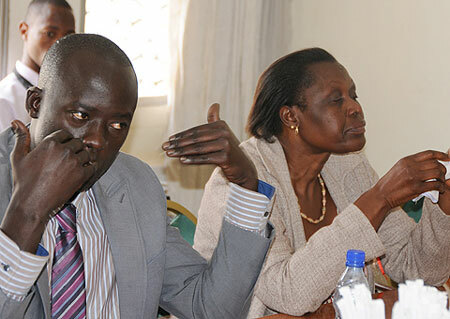 Odonga Otto, however, refuted Olanya’s earlier submission that the disease could be linked to the protracted war in Northern Uganda, reproaching the remark as incendiary. Otto also stridently rejected Alice Alaso’s submission that a report into the cause of the disease by the Center for Disease Control in the USA suggests a possible link to heavy metal poisoning. This normally occurs in war-prone areas. “As leaders, we should be the last people to alarm people. This kind of remark can make people flee entire villages,” a visibly riled Otto said. The Aruu County MP contends the disease is caused by malnutrition, especially chronic deficiency of Vitamin B6 that is key to brain development. However, when contacted, the health ministry spokesperson, Lukia Nakamate, said a number of research protocols on nodding disease have already been commissioned by the national task force on nodding disease. Nodding disease is characterized by head nodding, mental retardation, stunted growth, blindness, and wasting of the body. Little is currently known about the cause, mode of transmission and treatment of the disease. However, area politicians have chided both government’s response, which they have deemed sluggish, and its failure to declare the affected region a disaster area.